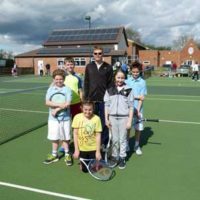 When Desford Lawn tennis Club (DLTC) started up in 2008 we played just on the floodlit double court, originally built during World War II, when the site was the Sergeants’ Mess for Desford Airfield. At this time there was no adjacent shelter for waiting players, coaches or parents at all. 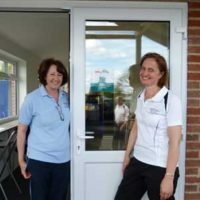 Therefore in 2010 SiD and DLTC raised about £2,000 to build a car port with sides in between the old squash court and the double tennis court. This arrangement at least provided some shelter, but was still open to the elements, especially as the enthusiastic club grew into playing 12 months a year. 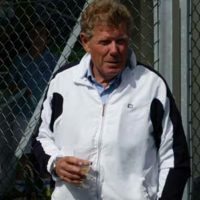 As a result SiD was able to raise a grant of £50,000 from Biffa Award, supported by a £5,000 contribution from DLTC in 2015. 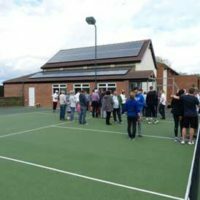 With these funds a fully fitted clubroom was built by local contractor, Andy Wakefield, to a very high standard and there were even funds left over to move the old car port to be alongside the new 3rd tennis court as a viewing platform built in 2012. In its present guise it is now known affectionately as the “Spanish Steps”. The new Tennis Shelter is a significant improvement to the courtside facilities providing a good viewing platform, a small kitchen area and a toilet. We were delighted that on the 25th April 2015, Mark Cox was able come and open the Shelter for us in grand style. It is now in very regular use, supporting the activities of over 120 members of DLTC.